Green Minneapolis has released The Commons 2018 Summer Season of programming and events. Green Minneapolis is under contract with the City of Minneapolis to operate, maintain, and program the 4.2 acre downtown green space. 2017 was a successful first full year of operation. 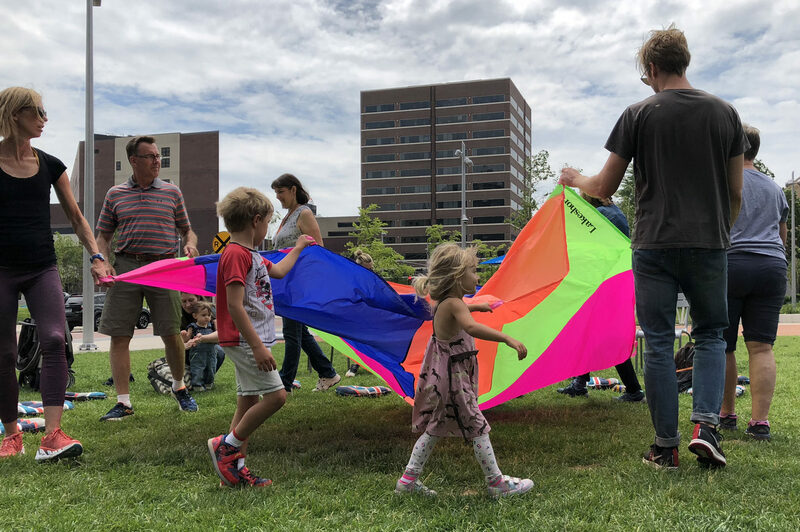 The Commons hosted 68 free community events, fulfilling the vision of an active and vibrant downtown park, and welcomed over 500,000 guests, not including attendees of stadium events. The summer kicked off with Northern Spark, an overnight festival celebrating the Twin Cities’ thriving arts community, and concluded with a free performance by the Minnesota Orchestra with over 3,500 people from diverse communities gathered together to share an evening of food, music, and enjoyment. In 2018, The Commons will continue its programs with the Mill City Farmers Market, Minnesota Orchestra, Northern Lights.mn, MacPhail Center for Music and Fly Feet Running. Green Minneapolis is proud to announce new partnerships with Minnesota Sinfonia, CreativeMornings/Minneapolis and Mixed Blood Theatre, among other local entities. Gathering input from community members and partner organizations, Green Minneapolis developed new events that include hip hop performances, a morning lecture series, lawn game leagues, and additional fitness classes. Graywolf Press poet Gretchen Marquette will serve as The Commons’ 2018 Poet In Residence, taking inspiration from the surrounding city and writing in the park each week. She will also host a series of outdoor poetry readings and lead writing workshops for all ages. Daily, The Commons is #YourDowntownOasis. Site amenities include a large building block set for children, a splash pad fountain, umbrellas for shade, table tennis, reading and games carts. Food trucks are regularly available. The Commons is also a site for events produced by other entities, including the X Games and other stadium related activations, festivals and private parties. “We are grateful for the sponsors and in-kind partners that have made this level of programming possible. Programming and sponsorship are essential to the operations of The Commons, to create the active and engaging destination park envisioned by City leaders,” said Beth Shogren, executive director of Green Minneapolis. Green Minneapolis raised $14M in private donations to enable the construction of The Commons. No additional construction will occur this year. Click here to see the full listings of the 2018 Summer Season. See www.commonsmpls.com/activities for updates and additions.